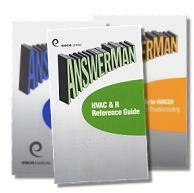 "HVAC & R Reference Guide"
The AnswerMan HVAC & R Pocket Reference Guide provides fast and easy answers that would otherwise require a library of textbooks. 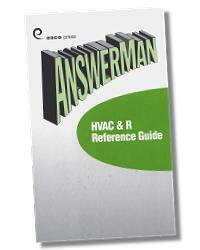 AnswerMan Pocket Reference Guide is a handy pocket sized reference manual that every air conditioning and refrigeration technician MUST have. AnswerMan Pocket Reference Guide isn't just a book, it's a tool that you'll use everyday. This book is a compilation of charts, graphs, formulas, and troubleshooting guidelines. Over 140 pages of useful information.